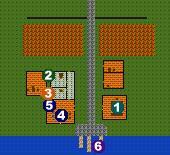 Assuming that you enter Marish by boat from Shayder, you should find yourself facing two buildings, one to the northeast and one to the northwest. The one to the northeast is Udell's shop. He sells a variety of useful and non useful items, so it's worth checking out his inventory. The building to the northwest is the Inn, which has a small apartment attached to it on the back, and a secret passage between the apartment and the Inn containing some dead bodies. The inn is run by a generic Innkeeper, which means that he doesn't have any information or gossip for you. Standing near the bar is a generic sailor, who spits and swears like every other generic sailor in the game. The last person in the inn is Mayor Yale. If you tell her about the dead bodies in the crawlspace you'll get one reputation point. She'll also give you a quest to locate and destroy the source of the undead who have been attacking Marish. The attacks are coming from the Chasm of Screams, which is covered in the Northwest Valorim section of this walkthrough. The last building in Marish is an apartment building, with two apartments. That completes the Isle of Bigail Section of the walkthrough. Return to Fort Emergence now, if you haven't already done so. You should have a high enough reputation for Erika to train you in Magery now, and you might have enough to be able to buy potions from Silverlocke in the center of the large lake in Upper Avernum. You should also recieve the Orb of Thralni quest from Anaximander at this point. The Orb of Thralni walkthroughs can be found in the Upper Avernum section.